I'm back! After taking a pretty lengthy hiatus from The Kitchen Holiday, I'm happy to report that I'm back in the kitchen and ready to share some new recipes. Since June, my summer got pretty hectic with lots of travel, work, and studying for the GMATs (so glad those are over! ), that I just didn't have time to take any pretty photos or get any non-business themed writing done. Now that things have settled down to a dull roar, I'm so excited to be back in this space and to share some new food ideas with you! Since we skipped right over the second half of summer and have reached the official beginning of fall, I've found myself craving warm, comfort food. Sure, maybe it's still 80 degrees outside some days and I may or may not have worn shorts this weekend, but despite all that, my body is recognizing the change in the air and is ready to quiet down and embrace the season. To ease into autumn, I found a new soup that's light enough to be appropriate for this in-between time of the year. This African Coconut Curried Soup is full of flavor, packs a little kick, and is satisfying with hearty chickpeas and brown rice. Plus, it's gluten free and vegan. I made a big batch on a Sunday so that I had leftovers to eat for lunch throughout the week, and it tasted great reheated. To start, cook the rice. You can use white or brown, whichever is your preference. You could probably even substitute some other kind of grain if you wanted to, like barley or quinoa. 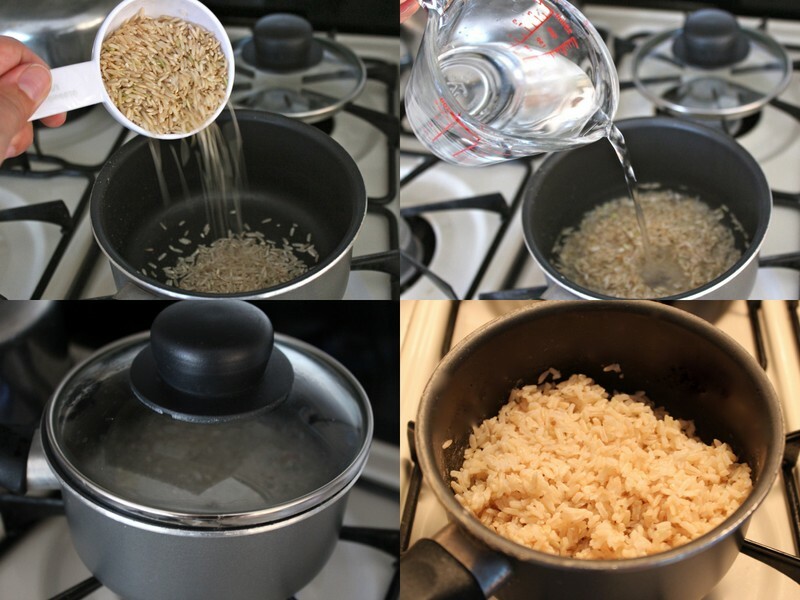 In a small saucepan, combine 1/2 cup of rice and 1 cup of water. Bring it to a boil, then lower the heat and simmer for 30-40 minutes for brown rice, or 20 minutes for white rice. Fluff the rice with a fork and set aside. Next, prepare the vegetables. 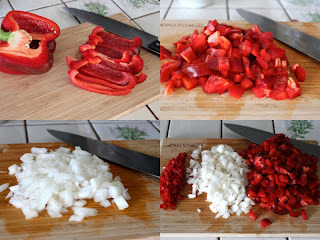 Finely chop the onion, seed and chop the bell pepper, and, *very important*, remove all the seeds and the white flesh from the hot pepper and then finely dice it. I don't handle spicy food very well, so I wanted to make sure the hot pepper was diced pretty small so that I didn't get any surprise spicy bites! Now you're ready to actually make some soup! In a large pot, heat the canola oil over medium heat. Add the peppers and onion and cook them for about 5 minutes, or until they're soft. While the vegetables are cooking, peel and chop the garlic. Add the garlic to the vegetables and cook for one minute longer. Now for the easy part - you just need to throw the majority of the remaining ingredients into the pot. Add vegetable broth, chickpeas, a can of diced tomatoes, curry powder, salt, and pepper. Stir it all together, then increase the heat to bring it to a boil. Once it boils, turn the heat down to low, cover, and simmer for 10 minutes. After the 10 minutes are up, add the coconut milk and rice. The recipe calls for you to wait to add these ingredients since coconut milk can separate if you boil it, and you don't want the rice to overcook. That being said, I totally screwed that up and boiled the coconut milk and everything was fine, so don't sweat it. It sure does look pretty though! Stir everything together, cover it again, and heat over low to medium heat for 5-10 minutes longer. You can serve the soup immediately, but it also tastes great as leftovers, as I can attest to after eating it for lunch for 4 days in a row. It's also freezable, if you want to have some variety in your week. Your choice! Enjoy, and sit back as the weather starts to get colder! Cook the rice according to instructions and set aside. In a large pot, heat canola oil over medium heat. Add the onion, bell pepper, and hot pepper and cook until softened, about 5 minutes. Add the garlic and cook for 1 minute longer. Add the vegetable broth, chickpeas, tomatoes, and spices into the pot and bring to a boil. Lower heat and simmer for 10 minutes. Add the coconut milk and rice and cook over medium heat for 10-15 minutes longer, avoiding bringing the soup to a boil. Serve immediately, refrigerate in an airtight container for 3-4 days, or freeze for several months. Sounds delicious! I think even Dad will like this...healthy and tasty! I will try it soon!